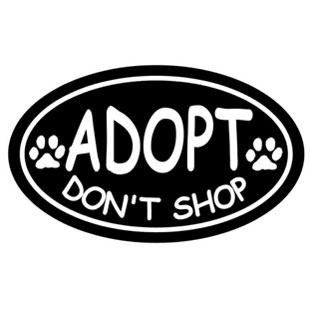 The Adopt, don't Shop campaign was started to bring public awareness to the plight of homeless animals and to encourage prospective pet owners to adopt from animal shelters and rescue groups as opposed to buying pets from on-line retailers or pet shops. While there are many reasons to choose to adopt your next pet, one of the most important reasons is to ensure you are not supporting and inadvertently endorsing commercial breeding facilities (puppy mills) that supply pet stores and sell pets online. Puppy mills are massive "factory style" breeding operations where hundreds of dogs are kept in filthy, deplorable living conditions without proper food, water, veterinary care, or human interaction. The sole purpose of a puppy mill is to mass produce puppies and sell them for monetary gain. There is no regard for the welfare of the breeding stock or the puppies that are produced. Puppies from puppy mills are often seriously ill, poorly socialized, and many times suffer from life-threatening congenital defects as a result of being poorly bred. Tragically, too, the breeding stock live their whole lives being bred over and over, and when they are no longer profitable, are simply discarded - either abandoned, sold at auction, or killed. National pet store chains that sell puppies take great pains to advertise that their puppies are from reputable breeders, but it has been proven time and time again that is not the case. Reputable breeders will never sell their puppies to a pet store. By adopting a pet from an animal welfare organization such as Hinsdale Humane Society, you will free up space for another homeless animal to have the opportunity to find a forever home. And by doing so, not only will you get a great companion, (as most pets in shelters are happy, healthy animals just waiting for someone to take them home) but you'll get a great bargain, too. Adoption fees are much less than the cost to purchase a pet, and animals at HHS are behavior evaluated, vaccinated, treated for parasites, tested for life-threatening disease, micro-chipped, and come with health guarantees. Many are already spayed or neutered, too. If it's a purebred you are seeking, over 25% of the dogs we receive are purebred. Whether you're looking for a high-energy running partner, a lovable lap dog, or a fun feline friend, our skilled adoption counselors are eager to help you find the right match for your family and home environment to help ensure you and your new four-legged family member And lastly, the personal satisfaction and pride you will feel from knowing you helped save a life will last a lifetime. Help us spread the message...Adopt, don't Shop!